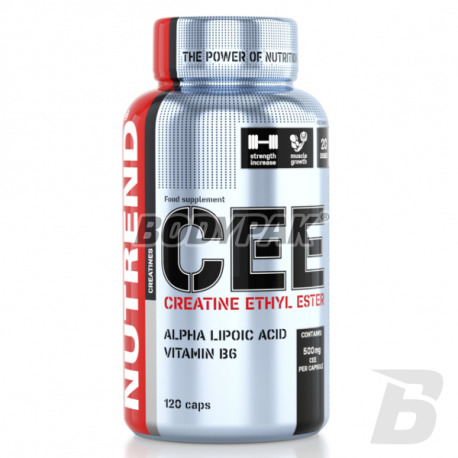 CreatineNutrend Creatine Ethyl Ester - 120 kaps. Cretin Ethyl Ester modern, stable and maximally utilized by the body form of creatine. In comparison with the classical creatine comes to achieve a similar effect with smaller dose by half. The most advanced form of creatine used up by the body. 1. 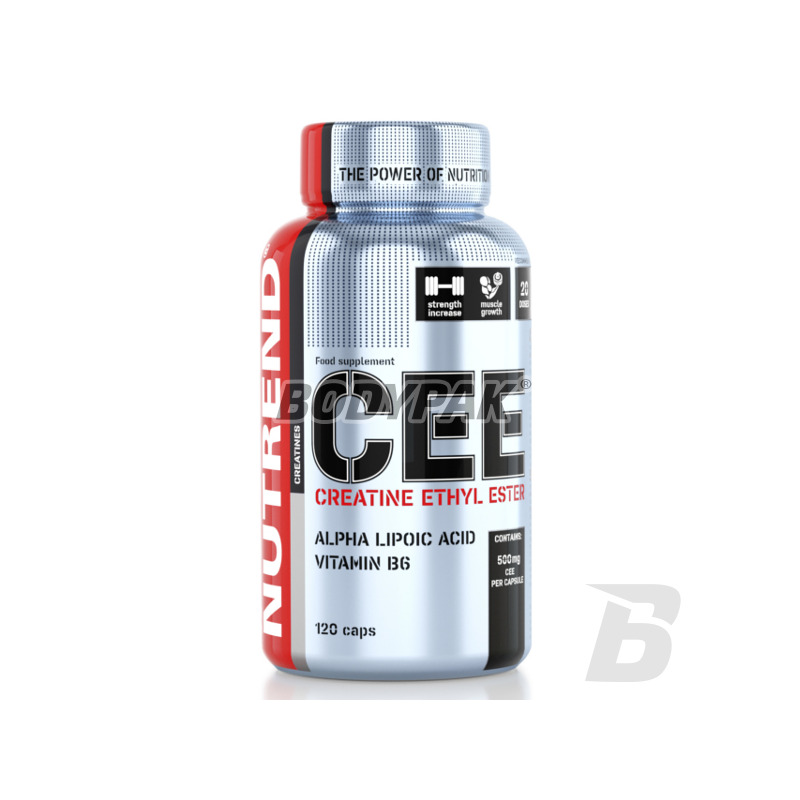 CEE - Creatine Ethyl Ester - the most advanced form of creatine. The combination of creatine with an alcohol results in good stability and complete use of the body as by esterification of a much better lipid solubility, and thereby in the lymph. Also transport into cells is much better than the older forms. In comparison with the classical creatine simply accepting half lower doses that it comes to a similar effect without the effect of water retention. Clinical trials have shown no adverse effects on the body. ALA is a coenzyme many reactions in the body, especially glucose to energy conversion - ATP. This process occurs in the mitochondria of the cell centers energetycznych-. When a sufficient amount of ALA in the blood, increases the sensitivity of cells to insulin. This effect is used in medicine which is administered in the treatment of diabetes, Type II diabetes. Moreover, ALA is a potent antioxidant. ALA works in synergy with CEE, especially in terms of increasing energy potential and regeneration of the body, thereby improving exercise capacity. Vitamin B6 is involved in a number of processes in the body, primarily in the creation of protein compounds. It is essential for the proper metabolism of nutrients - proteins, fats and carbohydrates. Participates in the formation of red blood cells. It is essential for brain activity. 3-6 capsules approx. 45 minutes before training. Recommended combination of Inosine. 3 - 6 capsules immediately after training. Recommended combination with BCAA, Cyclox. How to use: The capsules to swallow without chewing, with some water or drink from a series of Reg-ge. Do not drink alcoholic beverages or milk. Once opened, use within 3 months. Keep up to 25ºC. Działa o wiele lepiej niż klasyczny monohydrat - nie zalewa tak wodą, a siła wzrasta z każdym tygodniem. Rewelacja!